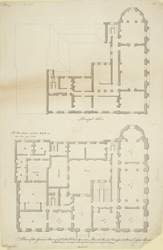 This ground-floor plan was published in Campbell's 'Vitruvius Britannicus'. Its title appears in English and French below the plans, with a scale bar at the foot of the plate. Taken from Vardy's original designs, the plan records the name and dimensions of each room indicating with the letter "A" the part of the house not yet built. The land was leased to John Spencer, later Earl Spencer, after the original proprietor, Baron Montfort, ran into financial difficulties and committed suicide. The architects John Vardy, James Stuart and Robert Adam all contributed to the design of the house which was completed in 1766.